Salmon is one of the things we eat most often in our house. It goes on the menu at least once a week, sometimes in the form of simple Garlic Cilantro Salmon, and sometimes more fancy, like in these Salmon Quinoa Burgers! Once I finally got my husband to enjoy salmon, I took full advantage of a delicious way to get our recommended 2 servings of fish per week. 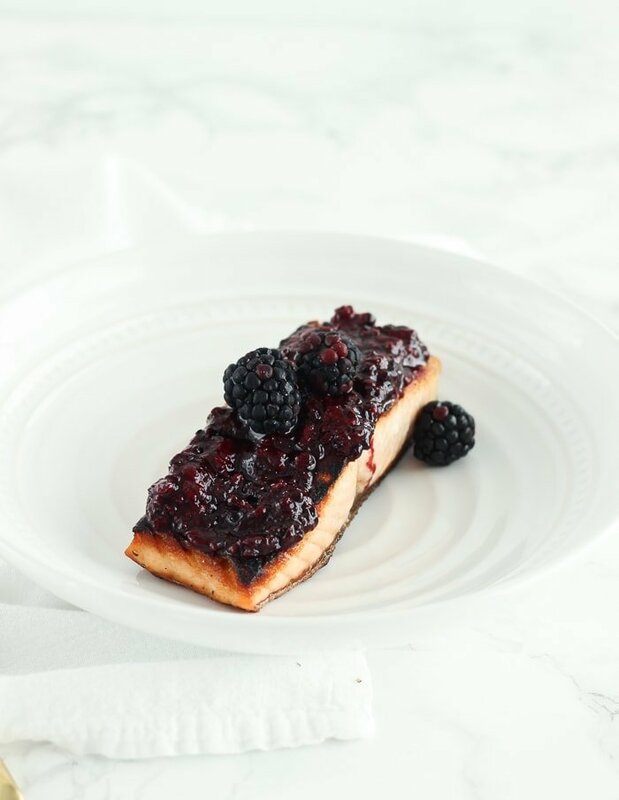 In my newest salmon recipe, Blackberry Glazed Salmon, I combine the heart healthy superfood with another nutritional powerhouse, the blackberry, to give it even more superfood status! Not only do blackberries contain vitamin C, fiber, and bacteria-fighting ellagic acid, but they are full of anthocyanins, which are antioxidants that fight free radicals. These anthocyanins also give blackberries their gorgeous dark coloring. Blackberries can even fight free radicals as good as (if not better than) blueberries! 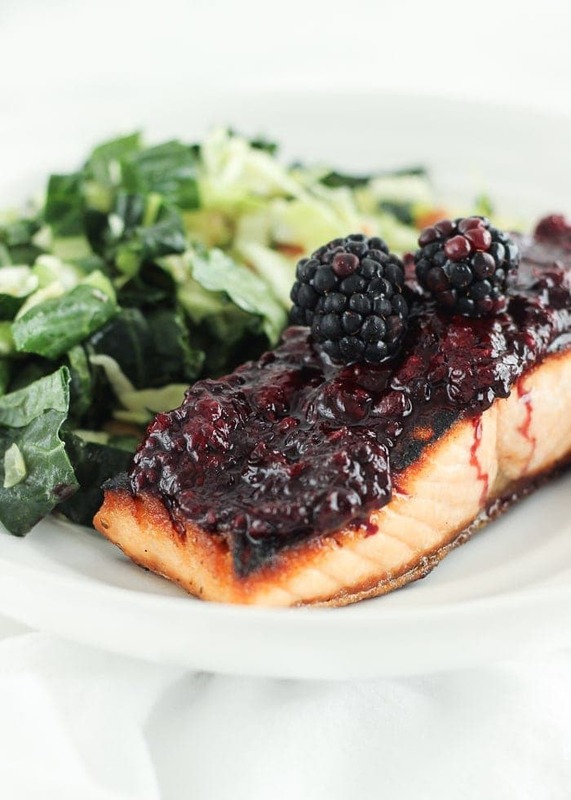 Blackberry Glazed Salmon is super simple to make, too. With only 6 ingredients, it comes together quickly for a delicious but impressive meal. 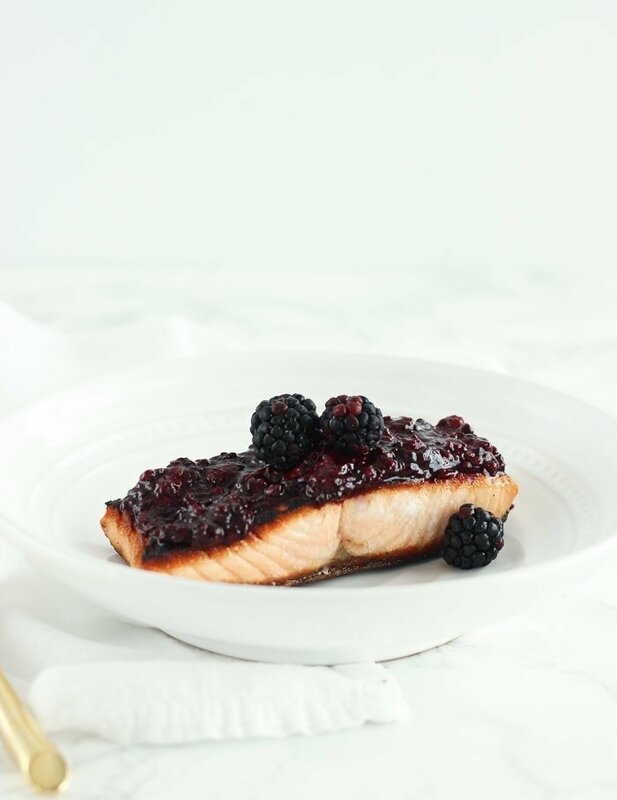 I absolutely love the sweetness that the blackberries lend to this recipe, along with the deep flavor of the sauce thanks to the wine and vinegar. Finish with a fresh sprinkle of basil if you like, and you’ve got a delightfully colorful dish that goes perfectly with any veggie of your choice. 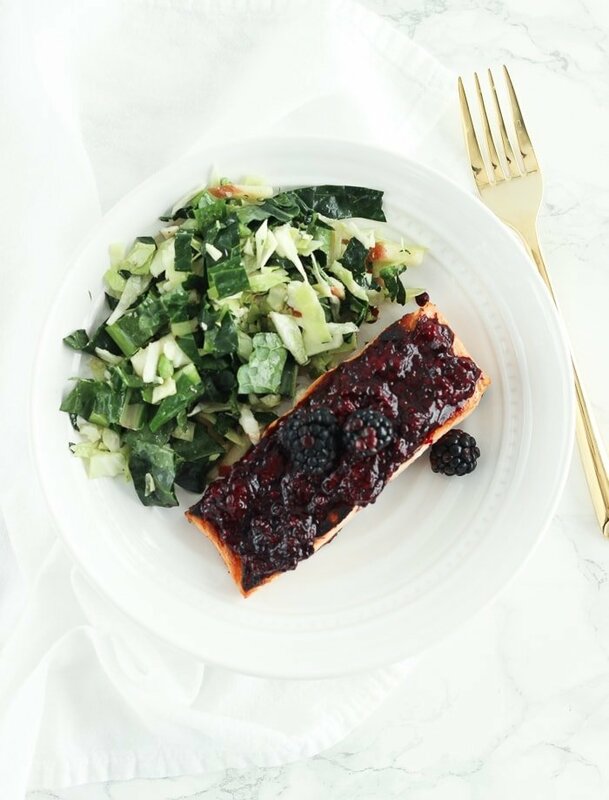 Heart healthy blackberry glazed salmon topped is a quick and delicious dinner loaded with antioxidants and omega-3s! Cut salmon into 4-6 oz filets (or have your butcher do it). Season with salt and pepper. In a small saucepan, combine blackberries, wine, vinegar, garlic and pepper. Heat over medium low heat and simmer until reduced to a thick sauce. You may have to mash the berries with a potato masher. Heat oil in a large nonstick skillet over medium-high heat. Add salmon filets, flesh side down, and press lightly with a spatula. Cook until crispy, then flip and repeat with skin side down, cooking for a total or 8-10 minutes, or until cooked medium on the inside but crispy on the outside. Place salmon onto plates. 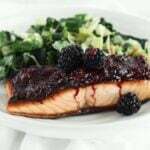 Spoon blackberry sauce over cooked salmon and top with sliced basil (optional). What a delicious pairing – and so easy to make! Pinning…. Definitely! I hope you love it! That is a stunning piece of salmon!! 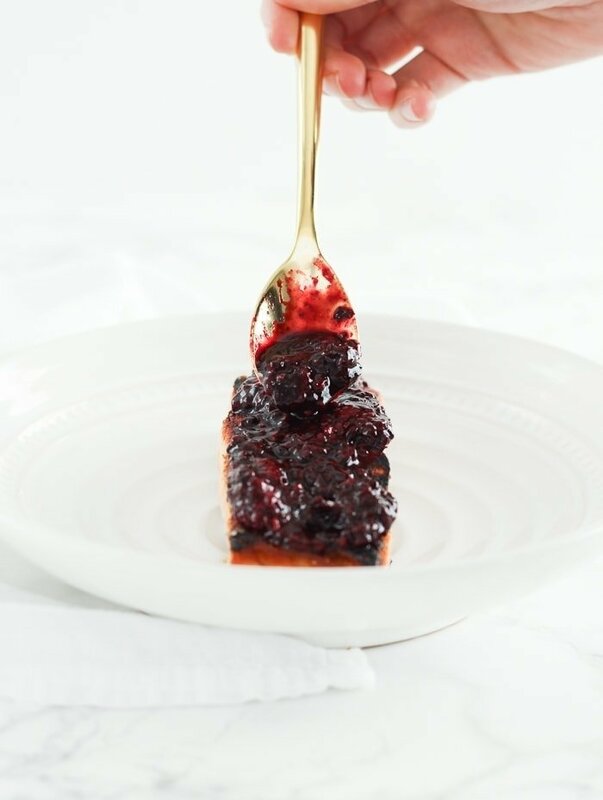 Can you clarify the measurements for balsamic and blackberries? It currently calls for 2 tbsp cup of balsamic, divided and 1 cup berries, divided but doesn’t say why they are divided or into what parts. Hi Tiarra, The recipe has been updated. I simplified it from the original version and forgot to update the ingredient list! Thanks for pointing it out.